The importance of reading to children can't be overestimated. The statistics concerning kids' reading levels and skills are alarming. According to the National Institute for Literacy,"More than one-third of America's fourth graders read at levels so low they cannot complete their schoolwork successfully. Levels are not much better for 8th graders,12th graders, or even adults." It appears that a child's early reading progress may affect that child for the rest of his or her life, so it's crucial to begin working on this skill as early as possible. Seventy-four percent of children who read poorly in the third grade continue to read poorly as they go through high school. The level of reading and writing skills a child develops by age five has a significant relationship to his or her literacy skills later on in life. Children from low-income families tend to be less prepared to succeed, and they may never be able to catch up to the same levels as children from more affluent backgrounds. High-quality early education can have lasting effects on a child's ability to learn. Many children don't have access to books except through their classrooms and school libraries. While reading to children at school is, of course, essential to a child's academic success, reading must begin at home. Some parents even begin reading to children while they are still in the womb. Reading expert Michael Maloney suggests that parents can help children improve their reading skills by encouraging reading and setting aside quiet reading times. It gives children information on a variety of topics. It promotes language development and literacy skills. Reading regularly raises reading and comprehension levels. It helps increase a child's attention span. When parents read to their children, it promotes family relationships. Book recommendations - The American Library Association provides lists of notable children's books, Newberry Award-winning books, and top ten lists to help parents as they assist their kids in choosing appropriate reading materials. Summer Reading Programs - You and your family can participate in your local library's summer reading program. These programs typically have planned activities throughout the summer. Certificates of achievement and gifts are also given to children who complete the program. These programs are free and open to the public, so be sure and check with your local library. Accelerated Reader - The Accelerated Reader Program is often incorporated into school curriculums as a way to encourage students to read. Ask your school librarian if this program is available. Be an example. Let your child see you reading books, magazines, and newspapers ever day. Spend time reading together. Reading should be fun. Even if your child is a preteen or even a teen, you can share time together reading popular books and discussing what you've read, sharing magazine articles, and reading the daily newspaper. Let your child read to you. Start out simple with easy-to-read books, and encourage your child to try new words. Set aside daily reading times. You and your child can end your day by reading quietly together. 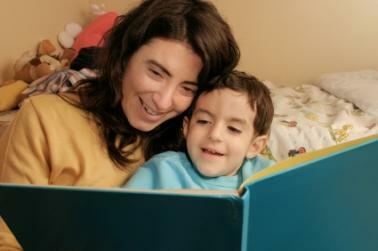 Finally, if you feel that your child needs additional help in reading, talk to his or her teachers and pediatrician. A child may experience difficulty reading due to an undiagnosed physical disability such as poor eyesight; alternatively, he or she may have a learning disability. Getting a professional diagnosis can help put a child back on track for reading success.